And so we arrive at the end of the Teen Titans in the New 52. It has been an incredible journey, from the heights of potential, to horrendous mediocrity, to these past few limped along months. For reasons that are unknown to me, DC Comics decided to stick with the core team and concept for the New 52 Titans for the entire five year span of the imprint, despite shaking things up pretty much everywhere else at the company. Heck, this comic has even survived past the New 52 itself, with Rebirth all anyone is talking about. Yet we come not to bury Teen Titans, but to honor it. Because Teen Titans goes out with an issue I always wanted from this series, but never got. 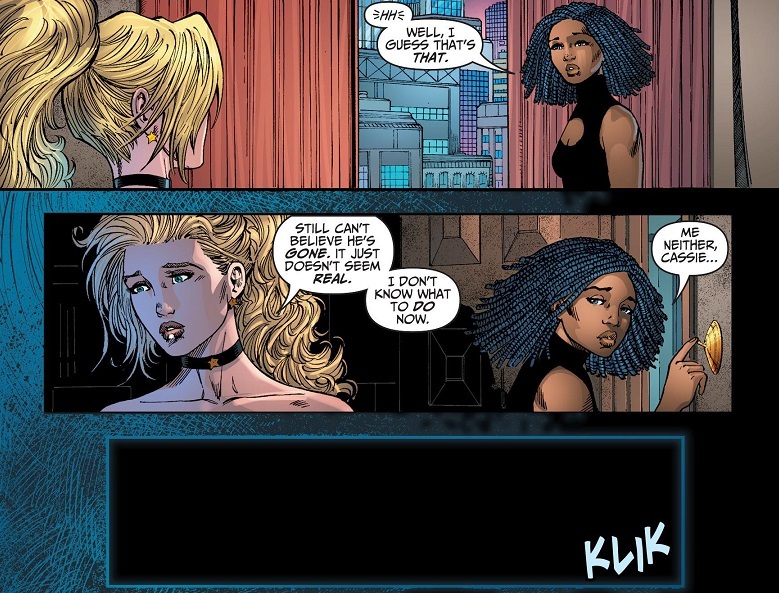 In fact, Teen Titans #24 proves there was a good comic hiding in these pages all along. Comic Review: 7/10 – Good. But even as we try to say goodbye to Teen Titans, I still get to hang my head and sigh one last time. Because this isn’t really the finale of Teen Titans, it’s an epilogue/tie-in to this week’s Detective Comics #940. So despite everything this comic has done for itself after all these years, despite keeping the core team and concept together all this time, Teen Titans doesn’t actually get to end on its own merits. The finale is just a follow up to another, much better comic. How embarrassing. 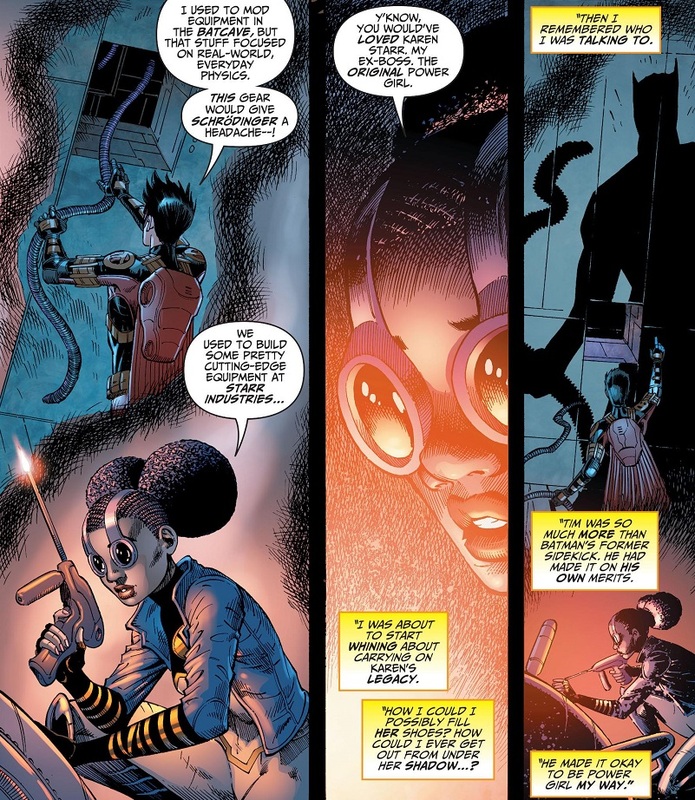 I will be spoiling the big news in Detective Comics #940, so don’t read ahead if you don’t want to be spoiled — though I’m not sure why someone would read my review of Teen Titans before reading that phenomenal Detective Comics issue. Suffice to say, Teen Titans #24 is a series of vignettes as the remaining Titans recall some of their favorite moments with one of their favorite team members. The scenes have real character to them, the sort of character that was almost entirely missing from Teen Titans as a series. If we had anything in the comic even approaching the scenes mentioned in this final issue, Teen Titans could have been pretty good. Instead, we bid everybody goodbye and will likely speak no more about this version of the Teen Titans. Let’s hope the next people do a better job. Join me after the jump for a full synopsis and review! Or, more precisely, Tim Drake has been kidnapped by the mysterious Mr. Oz, and everyone just thinks that Tim Drake is dead. 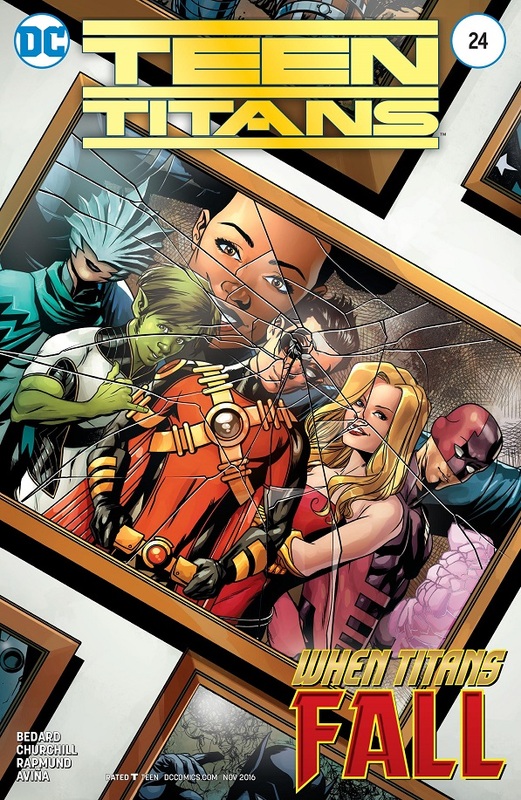 They’ve apparently held a funeral for him, and Teen Titans #24 picks up a short time later, with the Titans alone and sharing happy memories of Tim. Bunker thinks back to a time when Tim asked him for fashion advice for an upcoming high school reunion. The girls would have fashion advice too, Tim. I’m just saying, Beast Boy would not be your only other option. The two friends had a great time picking out an outfit for Tim, then they decided to join a spontaneous gay pride parade they ran into. Miguel marveled at how easily Tim Drake could make friends. Power Girl said she felt reassured and grateful for his friendship. Raven recalls a time shortly after the Titans saved her from her father, Trigon. She just wanted to be left alone, but Tim insisted on spending time with her because she needed a friend. Raven got so angry that she teleported both of them to Azerath, intent on driving Tim insane from the dark world. But Red Robin took it in stride. Hey Tim, are you posing for the cover of a romance novel? Raven said she was also grateful for his friendship and understanding. Beast Boy shares a general understanding of how awesome Tim was compared to the other Robins, and lays a little groundwork about the upcoming team with Damian in charge. Wonder Girl tells a story from when the Titans were on the run recently, and she and Tim went to the supermarket to pick up supplies. This was my favorite story, because it finally addressed the very, very slight budding relationship between Tim and Cassie. I totally ‘shipped the two of them, because it was something new and interesting instead of just sticking her with Superboy like from before the New 52…except somebody decided not to put Tim and Cassie together, and then DC later revealed that Tim hooked back up with Stephanie Brown in Rebirth. Anyway, Cassie tells how she actually confronted Tim about why nothing happened between them and how he never tried to kiss her again. Why was this not in any other comics?! Tim dances around the question until a nearby factory catches fire and the two of them rush off to help. Cassie was impressed by Tim’s skill and coolness under fire. Only later did she find out that Tim never hooked up with her because he was already dating Spoiler, which is a disappointing retcon, considering how much could have been done with Tim dating Spoiler (or Cassie) in Teen Titans. But again, this wasn’t that kind of comic. After everyone shares their stories, they ask themselves, “What next?” Surely Tim would want them to continue the Teen Titans…but at the same time, Tim was the one who kept them all together. So in a matter of a couple panels, the various Teen Titans all kind of just shrug and decide to go their separate ways. They’ve all got other things they could be doing with their lives. The issue ends with some of the Titans sharing the sentiment that the team just isn’t the same without a Robin in charge…and we see Damian in the Batcave staring at the Red Robin costume memorial. And that’s it! Turn off the lights, we’ll all go home, and DC will try again with a new version of the Teen Titans in another month or two. So long, past five years of Teen Titans comics, you don’t even get your own final issue. You get to serve as a simple, harmless epilogue to the much better Detective Comics. In the end, I don’t think anybody will care. But I care that this issue contained some actually worthwhile scenes that I would have loved to have seen in the actual series! Why didn’t we get any of this stuff before now?! Miguel helping Tim pick out clothes for a high school reunion? Tim going to his high school reunion? The two of them joining a gay pride parade? Come on!! Any one of those would have made for a great issue of Teen Titans! A much better issue than the group of them fighting some random, pointless supervillain ad nauseam. Or what about Tim spending quality time with Raven and/or Power Girl? We didn’t get anything of the sort! Tim cracking jokes about science?! Where was that?! 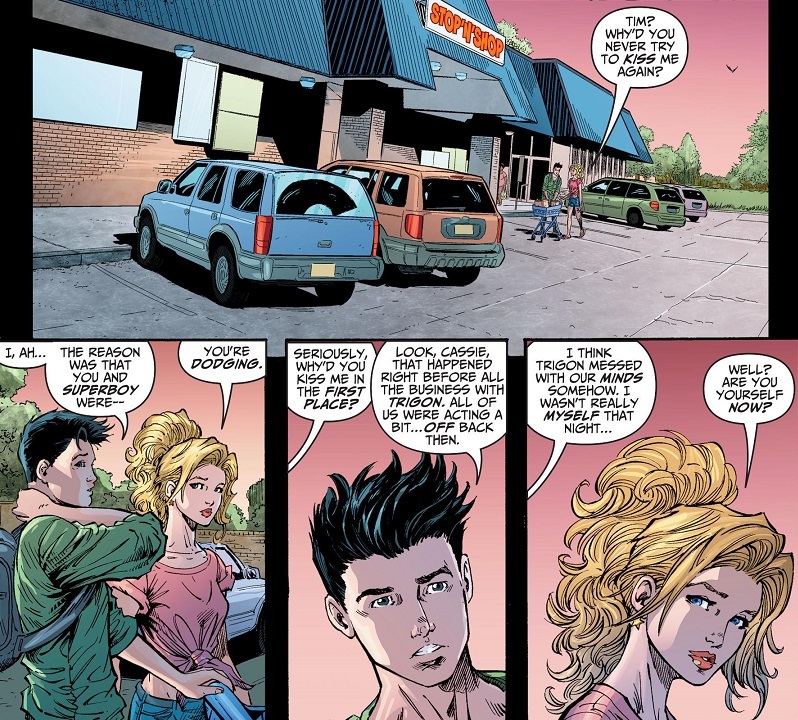 I would have gladly read an entire issue of Tim and Cassie out of costume at a supermarket as they talk about their relationship and why they never hooked up. That is real character drama! That is the stuff good stories are made out of! But we didn’t get any of that. Instead, we got Teen Titans. It was a long, dumb slog of a comic. DC apparently did not care to tap into any of the teenage drama that has made for other, more successful comics. They didn’t want to do anything even close to resembling the popular Teen Titans or Young Justice cartoons. No, DC treated these characters like action figures. No depth, very little character drama, nothing at all on a personal or even human level. DC kept them in costume all the time and smashed them up against whatever random supervillain they would trot out next. No long term stories. No real arcs for any of the characters. I am not sad to see Teen Titans go. I’m grateful that DC is finally putting this comic to rest and trying something new and hopefully better with the title. I’m grateful that one of my favorite comic book characters, Tim Drake, is in better hands with better stories being written about him — even if we might thane to wait a little while for the Mr. Oz/Rebirth crossover to pan out. This comic was a mistake. Some good, creative people tried their best to make it worthwhile, but for reasons I may never know or understand, DC had zero interest in making Teen Titans thrive in the New 52. DC didn’t learn any lessons. They didn’t seem to have any idea what they were doing. I just don’t think DC cared very much about the Teen Titans in the New 52. And now I don’t have to either. Cheers. Posted on September 15, 2016, in Comics, DC, Reviews, Robin and tagged Red Robin, Teen Titans, Tim Drake. Bookmark the permalink. 9 Comments. G’bye guys, here’s hoping you get the comic you deserve when you get Rebirthed. We can all agree that the New 52 Teen Titans was an Afterbirth. I hear some people eat the afterbirth! I stopped caring about the supposed stories a long time ago and just made up my own using the art. 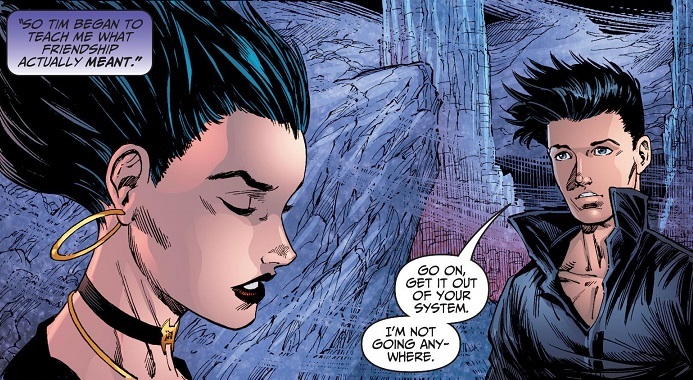 Something I would have liked to see was a Robin/Raven relationship. It would have been different and in written right, fun. The art was usually always top notch on Teen Titans, that’s for sure. But Robin and Raven, eh? It would have definitely been more interesting than what we got! It has been an honor to serve. I just want them to keep Bunker. I do hope he turns up somewhere nice. It’s good that they celebrated Tim more than anything. Sure, it’s a massive case of “show, don’t tell”, but it’s better than whatever crap would’ve otherwise been in this issue. So goodbye, New 52 Teen Titans. You were… you were.